Comments below made by Graham Bishop, Investment Manager at Heartwood Investment Management, the asset management arm of Handelsbanken in the UK. A focus on key dates can give us some indication of the few hard deadlines ahead. 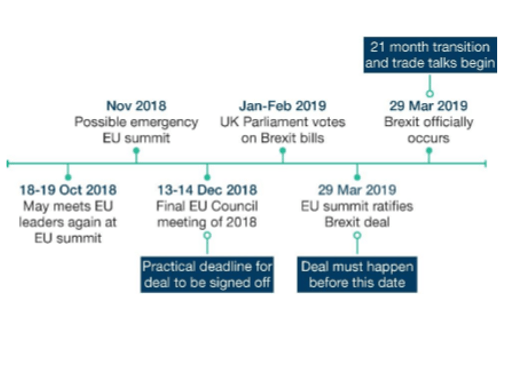 Perhaps the most crucial are the EU council meeting in mid-December (by which the current negotiations must bear fruit if any deal is to occur), and the early 2019 parliamentary Brexit vote. It goes without saying, though, that considerable opacity continues to surround the entire Brexit process. Unfortunately, we are probably yet to hit peak uncertainty, and should expect more noise ahead of any clarity. Throughout the Brexit process, sterling has served as a barometer for investor sentiment, buffeted by perceived advances and setbacks in talks (often surrounding the challenging Northern Irish border debate). The currency continues to hold centre stage, and could determine how UK equities perform ahead. What would a ‘deal’ scenario mean for the economy? A Brexit deal could refer to any number of outcomes, from a Canadian style arrangement (changeable, and without tariffs for goods, but with barriers for services) to a Chequers approach (with a single market for goods but not for services, solving the Northern Irish issue while leaving the UK subject to the bidding of EU regulators). Another oft-touted possibility is the Norwegian model, which sets out a single market for goods and services but which would leave the UK subject to EU law (over which it would have no control). The latter is therefore potentially the most untenable outcome for hard-line Brexiteers. Under any viable deal scenario, ‘UK plc’ (a shorthand for the collective commercial interests of the UK) would remain recognisably the same for the time being, and the Brexit transition period (until 2021) would allow time to address trade arrangements and other loose ends. Comforted by this new clarity, the Bank of England would probably increase the pace of its monetary tightening – raising interest rates and reducing other monetary support for the economy. In this hypothetical environment, government bond yields would likely rise, while sterling (which is currently relatively out of favour) could rally. In this sense, a deal scenario could hamper larger UK businesses, which generally generate a significant proportion of their earnings overseas (making the translation back to a stronger sterling more painful), but could benefit smaller firms, which tend to be more focused on their home market. What would happen if the UK doesn’t get a deal? We see this as less likely than a deal scenario, but still entirely possible. Indeed, recent mood music emanating from the EU (including the handling of Prime Minister May in Salzburg) has made some commentators lose confidence in the possibility of any convincing deal. In some ways, the reactions to a ‘no deal’ scenario would be the inverse of a deal outcome. At the outset, gilt yields would be probably fall in tandem with sterling, and within equity markets large-cap companies would likely outperform small and mid-sized businesses (given the conversion of overseas earnings into a weaker sterling for the former, versus a focus on an anxious domestic market for the latter). Using the referendum result in 2016 as a model, the Bank of England would likely look through the potential risks to inflation and a weakened sterling, cutting interest rates and introducing further quantitative easing to support the economy in the near term. However, just as there is no single ‘deal’ outcome, there are multiple versions of a ‘no deal’ scenario. In this range of outcomes, though, the UK would be the one to set the tone, and its handling of potential global partners would determine the severity of its economic experience. The UK’s approach not only to trade but also to tax and regulatory matters would be key; an insular, protectionist style of Brexit would produce vastly different outcomes to a more extrovert, open approach to dealing with the rest of the world. Unfortunately, the unifying feature of all ‘no deal’ scenarios would likely be short-term pain as significant uncertainty was absorbed by markets and the wider economy. 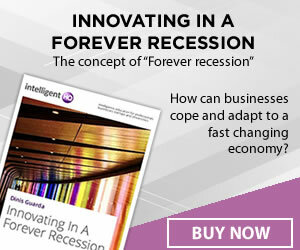 The outlook for ‘UK plc’ would change overnight, and the risk of a recession would rise. Political risk would also skyrocket, as the government would likely become untenable in its current form; the electorate would be unlikely to have much faith in leaders who had failed to deliver on the defining policy outcome of this generation. 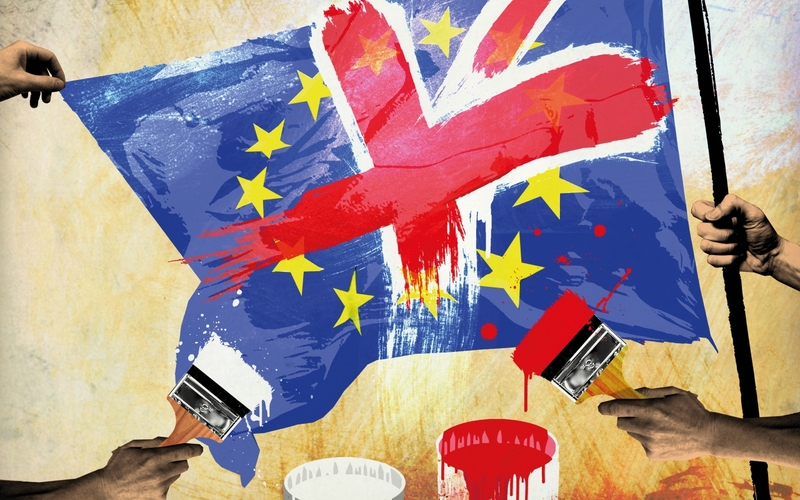 While it is not currently clear how the Brexit situation will resolve itself, what is apparent is that there will be many twist and turns in the days, weeks and months ahead.